Montreal Canadiens center Tomas Plekanec (14) is congratulated by teammates after he scored a goal against the Tampa Bay Lightning during the second period. TAMPA, Fla. (AP) — Montreal goalie Carey Price had his second strong game this season against Tampa Bay, and this time got a much better result. Lars Eller scored the lone shootout goal, Price stopped all three shots he faced in the tiebreaker, and the Canadiens beat the Lightning 2-1 on Saturday night. "I really appreciated our team effort," Montreal coach Michel Therrien said. "The energy was there right from the get-go. Guys competed hard, they were quick on puck, and we didn’t force plays when we didn’t have to." Valtteri Filppula, Nikita Kucherov and Teddy Purcell all failed to score on Price, who made 44 saves in a 2-1 shootout loss to the Lightning on Nov. 12. "You’ve got to be happy with three saves," Price said. Eller made a couple moves before beating Ben Bishop on the Canadiens’ first shootout attempt. Eller has made all three of his shootout attempts this season. Tomas Plekanec scored in regulation for Montreal. Price stopped 23 shots through overtime. "He’s been phenomenal," Therrien said about Price. "In the third period, when they gave us a push, he was making key saves. He showed again tonight he is one of the best goalies in the NHL." Martin St. Louis scored for the Lightning, who also got 20 saves in regulation and overtime from Bishop. Tampa Bay had its five-game winning streak end. "If there is a silver lining, we do get a point out of this," Lightning coach Jon Cooper said. Plekanec opened the scoring, beating Bishop with a backhander 5:15 into the second period. It was his 169th goal, which moved him past Shayne Corson and Gilles Tremblay into sole possession of 31st place on Montreal’s career list. St. Louis tied it from the top of the right circle on Tampa Bay’s sixth shot of the game at 11:43 of the second. The Lightning captain has a goal in four straight games and eight points during a six-game points streak. Montreal had the first six shots, including an in-close backhander by Daniel Briere and a shot from the left circle from Plekanec. Nate Thompson got Tampa Bay’s first shot 11 minutes into to the game, a backhander stopped by Price. 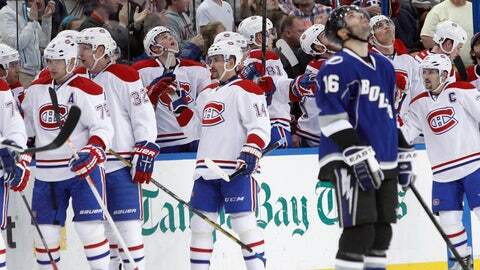 The Canadiens outshot Tampa Bay 15-9 through two periods. "That was a tough start for us," Cooper said. "Our timing was off, our passes were off. A good thing Bishop was on because that could have gotten ugly for us quickly." Bishop had won his previous five starts, allowing six goals during the stretch. The Lightning had nine of the 11 shots during the first 9 minutes of the third, and 14-6 overall edge in the period. Price made a save midway through the third on Radko Gudas’ backhander. NOTES: St. Louis has 950 points, two behind Rick Tocchet for 89th on the NHL list. … Montreal D Josh Gorges returned after missing a game because of a lower-body injury. … Tampa Bay D Eric Brewer and D Sami Salo both sat out with upper-body injuries. … Canadiens rookie LW Michael Bournival, pointless over his previous 13 games, didn’t play. … Plekanec has 420 points with Montreal, one away from tying Stephane Richer for 29th on the team list. … Montreal LW Max Pacioretty left early to receive stitches for a cut in his mouth, but returned to finish the game.